Finely shaved Brussels sprouts add tons of texture to this entrée salad recipe. Finished with Jones bacon, almonds and an apricot dressing. To make dressing, whisk jam, vinegar, shallots, olive oil, salt and pepper in small bowl. Refrigerate dressing until ready to use. 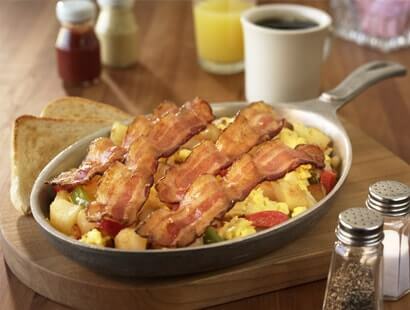 Cook bacon according to package instructions; set aside to cool and crumble or chop. Trim ends off brussels sprouts and soak in bowl of water 5 minutes. Remove brussels sprouts from water and pat dry. Using a mandolin, shave brussels sprouts into thin slices to make a slaw texture. 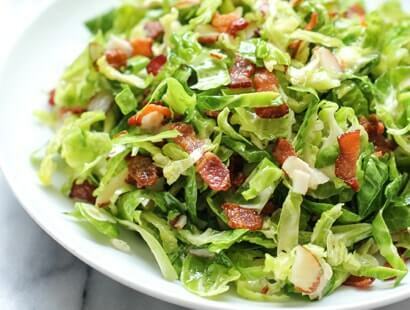 In large serving bowl, toss together crumbled bacon, shaved brussels sprouts and almonds. Toss with salad dressing. Serve immediately.